I just received my Palette O'Prints, it's a double sided pad of Designer Series Paper, that will be on promotion during the month of May. For one month only, you'll be able to order/earn this pad of 48 sheets of awesome 6"x6" patterned paper. 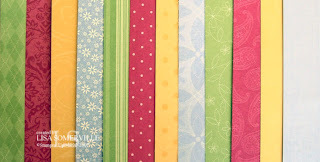 Shown here is a sampling of the papers - there are 12 designs in 4 colors (Certainly Celery, Rose Red, So Saffron and Almost Amethyst). These papers will also be available for purchase in the new Idea Book and Catalog! You can see more detailed swatch samples here. I'm looking forward to showing you these great papers in some upcoming classes and workshops. For more details on the Palette O'Prints promotion - contact your Stampin' Up! Demonstrator.